Rodney McAree says he wants to make it a hat-trick of Irish Cup finals for Coleraine. The Bannsiders have made the last two showpiece finals losing to Linfield in 2017 and beating Cliftonville 12 months later. McAree is targeting a treble with the cup holders, but they have the small matter of H&W Welders in the fifth round first before they can start planning for Windsor. 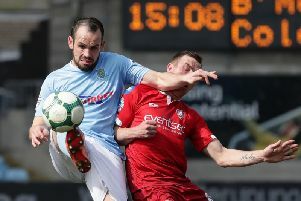 "They've caused upsets down the years and we have to make sure another one doesn't happen at The Showgrounds," he said. "We certainly won't be taking them lightly. There are always upsets in the cup and we have to make sure it's not us on the day. "We will pay them the same respect as we show any other team, and we will do our homework on them. "Our target has to be a third Irish Cup final in a row. Football is all about winning major honours and that's what we want to do."